Ginkgo is naturally extracted using only the finest quality Ginkgo biloba leaves. Our Standardized True Spectrum extract provides active levels of ginkgoflavoneglycosides and terpene lactones (average of 2% Ginkgolide B), concentrated in the balanced ratio nature intended, without isolating, fractionizing or using toxic solvents, harsh chemicals or gases. 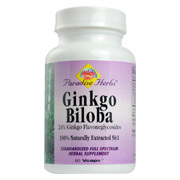 Ginkgo biloba contains powerful antioxidant flavonoids and supports normal concentration, memory and circulation. Ginkgo biloba is the oldest living tree species and can live as as 1,000 years and grow to a height of 120 feet. It has short branches with fan-shaped leaves. Research has focused on the standardized Ginkgo extract which is produced from the leaves. Ginkgo is made up of ginkgo flavone glycosides, several terpene molecules unique to ginkgo and organic acids. These molecules are thought to have the ability to fight the many effects of aging which include improving blood circulation reducing inflammation and protecting brain cells from damage caused by lack of oxygen. Its strong antioxidant properties may protect central nervous and cardiovascular systems from damage and the effects of aging. Ginkgo is a powerful aid to circulatory problems, particularly a lack of blood to the brain that may be associated with memory loss, vertigo, tinnutis, disorentation, headaches and depression, especially in the elderly. Ginkgo improves blood circulation by reducing the stickiness of blood platelets. This improved blood flow may inhibit or treat heart disorders as well as stroke. Ginkgo may be effective in preventing the onset of age-related mental deteriotation. It is often recommended for older people suffering from dementia. 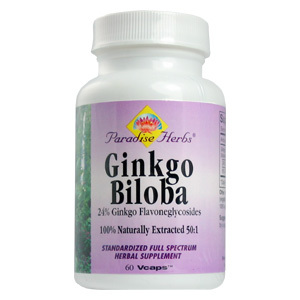 Ginkgo, as well as rhodiola and cordyceps, have all been effectively used for impotence and erectile dysfunction. Ginkgo may help reduce certain premenstrual symptoms for women such as fluid retention and breast tenderness. It is considered safe and side effects are rare; it has blood-thinning properties and should not be used with blood-thinning medications. Ginkgo Biloba - is shipped in a discrete, unmarked package. Orders are processed immediately and usually take about 3 to 5 working days to be received. We do ask that you try it for 2 to 3 weeks to feel the full effects. Any information received is used only for order processing and shipping purposes. Your information, such as e-mail address, will never be disclosed to a third party.